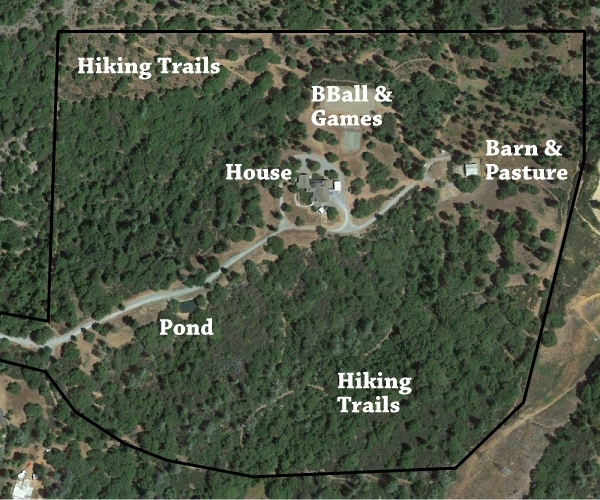 Read more below about the Ranch's Gold Country location, weather, and maps. This section also includes pages with farm-stay information about the ranch livestock (horses, llamas, cattle, and pasture-raised chickens that provide eggs for guests), an option for guests who want to bring their own horses, and photo ideas from special events. 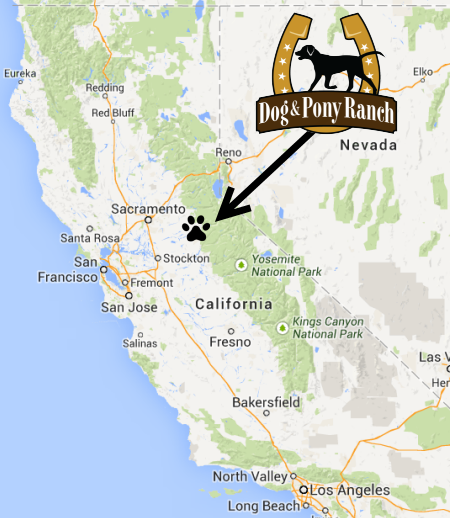 Dog & Pony Ranch is located in the "motherlode", the Highway 49 foothills where gold was discovered in California. Amador County is rich with historical sites and small town charm, along with the new "gold" of the area: vineyards and wineries! See the local info section for recommendations of the many fun things to do nearby (golfing, caving, rafting, skiing, gold panning, live music and theater, etc). The house is situated in the middle of the 60 rolling acres on a hilltop providing stunning sunset views to the west. It overlooks the Sacramento valley with views all the way to Mt Diablo in the East Bay on clear days. Neighboring vineyards add to the wonderful views. Specific address and map will be sent to guests before their arrival. At 2200' elevation, the house is above the valley fog but below the heavy Sierra snows getting only an occasional dusting in the winter while just a short drive to the ski areas. The weather is similar to Sacramento, with temperatures typically a bit warmer in the summer and a bit cooler/wetter in the winter than most of the Bay Area. See weather forecast including average hi/low/precipitation by month.